Thank you for all the kind comments on my cozy little corner. It seems there is a color revolution going on out there. It's nice to finally be in a place that following the latest fads doesn't have to over power what we love. Being inspired by talented designers is great but but don't you think that sometimes trends change just for the sake of getting us to buy new stuff. 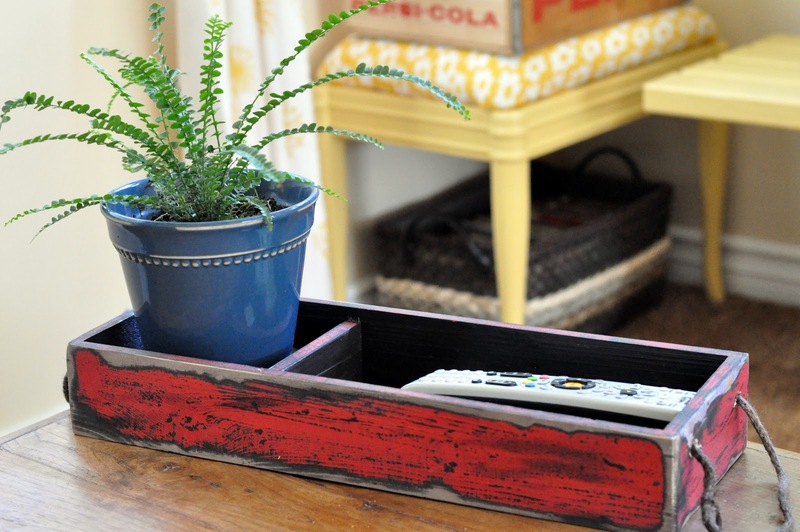 For me the balance comes in incorporating one or two new accents without replacing everything that is dear to me. I have allowed myself two owls (and trust me it was with great restraint that I allowed only two) one here in the living room and a gorgeous owl vase in the dining room. They were in the colors I love and they just seemed to fit where I placed them. Everything else is pretty classically me. The pops of colors in the pillows...the large orange pillow is actually a removable pillow case that I made out of a vintage sheet. I used buttons to close it up so that I can easily toss it into the washing machine every couple of weeks as it becomes soiled. This is our only sofa and it get used every single day. People are going to need a place to lay their head, so having one removable pillow case made perfect sense. 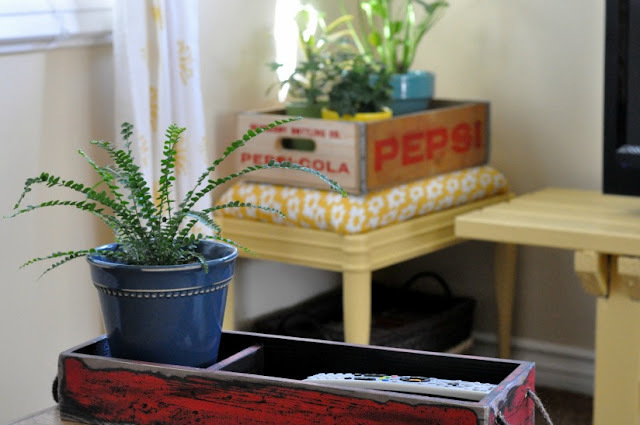 The small red crate on the coffee table was from Home Goods and it holds all our remotes. It originally came with three dividers but I removed one so that it would better suit my purpose. 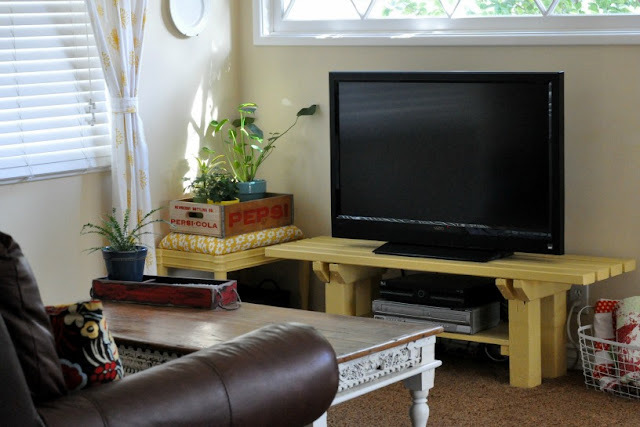 The TV stand is actually a repurposed bench from out back. My husband added the shelf underneath to hold the cable box and VCR and I painted it Martha Stewart Cornbread yellow. You've seen my favorite corner before but directly across from it is my other favorite spot. This old leather chair is where I sit to have my morning quiet time. It is also one of Bear's favorite napping places as you can see. Since this is a working living room there is also a spot for toys. I promise I edit it down to the one large wicker basket regularly, but another tote always makes it's way into this corner somehow. One of the comments I get quite often is that our home looks like a real family lives here. I love that. Marrying pretty with function is very important to me. My goal is for you to walk into our cottage and know it is mine, to ask for a cup of coffee and to curl up and stay a while. Thanks for stopping by. I always enjoy our visits. Come back again real soon! I love it. The punches of color are beautiful. 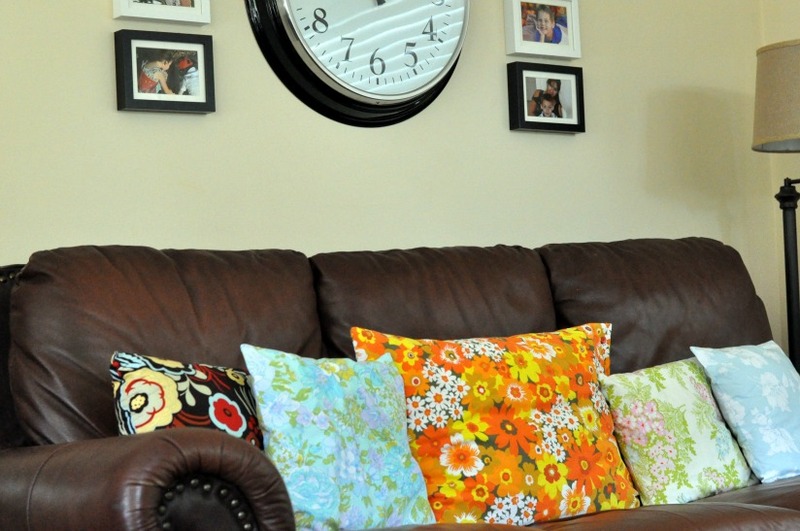 I love the pops of color added to the leather sofa. Joe and I are leaning towards a leather sofa because of our fur kiddos who we love more than anything. I love color too and agree with you, we should have what we love in our homes,not what a newest trend is. Although some the trends like all white is very pretty,I need color in my life. Your room is full of the colors I love too, its a happy room where I would want to curl up in. I enjoyed your post very much. I want to come and sit in there myself! Love your use of color! It's so cheery. I feel the same way about trends. Your home needs to reflect you and your family, not what's in at the moment. I love what you've done. Patty, I love your happy cottage home!! Thank you for not shying away from color or whatever it is you love, for that matter! I love color, too. Right now it's on my walls so brightly that my accessories are a bit more neutral, but with spring on the way I get excited about my yellows and fresh greens around here again!! 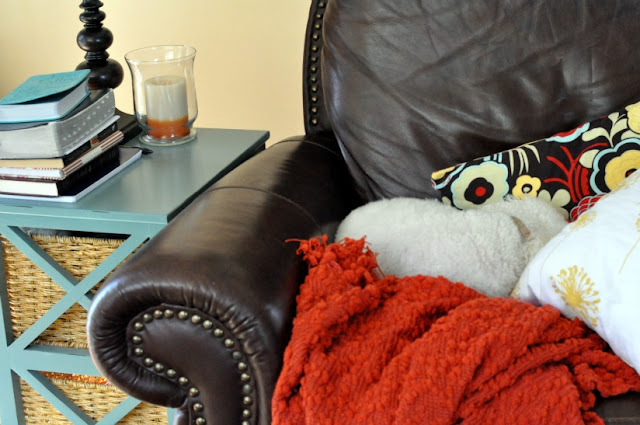 I love your doggie, and I noticed your stack of Beth Moore books. I enjoy her books so much, and she's such a REAL example of Christ for women! Love it all ... the colors, all so different but blend so well. Thanks for the inspiration. Patty, I love it, and it's just how I imagined it would be. Look very comfy indeed! Beautiful, comfortable and loving living room!!! Loved seeing the toys in the corner! Patty your house makes me so happy. I love all the color. Love love love!! I love the colors you have in your living room. So cheery. I especially like the last picture in the post with the tea cup and pitcher. You have a wonderful sense of what goes together. 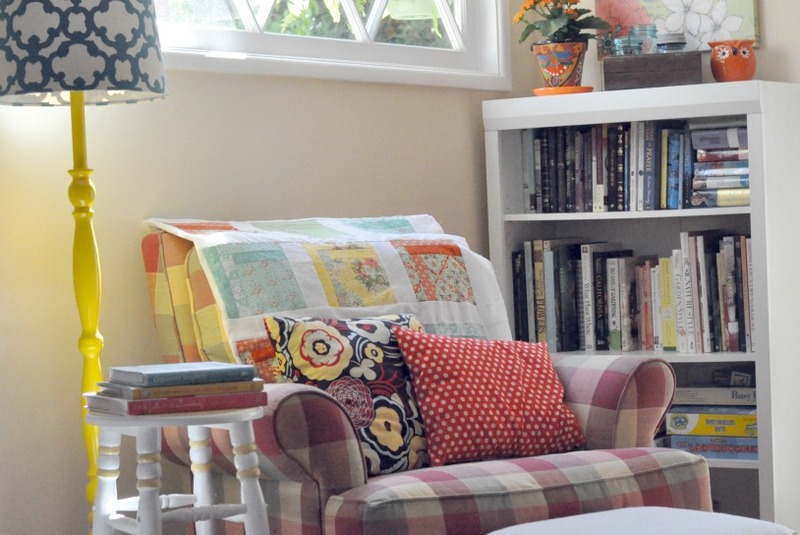 I agree with what you say about decorating with what you have and what you love...I never had the money to be trendy...I make all of my pillow cover and table mats and toppers...I love your cottage...cute, colorful and very real!! "... don't you think that sometimes trends change just for the sake of getting us to buy new stuff"
Of course this is true! And modern, American-style capitalism doesn't work without lots of discretionary spending on new things. Thankfully, there are plenty of people to do that while the rest of us enjoy what we love regardless of what's en vogue. I love your house. It looks so comfortable and beautiful. Hi Patty, I just love a home that reflects a family's personality! Trends are just that....trends. 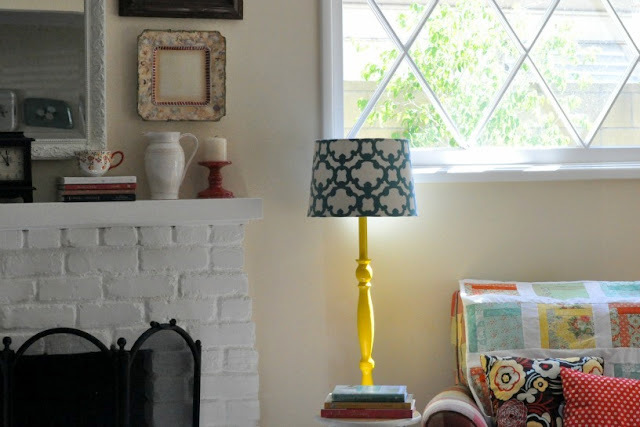 Decorating with things and colors that you love speak 'home' to me. I have things in my home that I have had for many, many years. I just move them around or add a new accessory here or there. 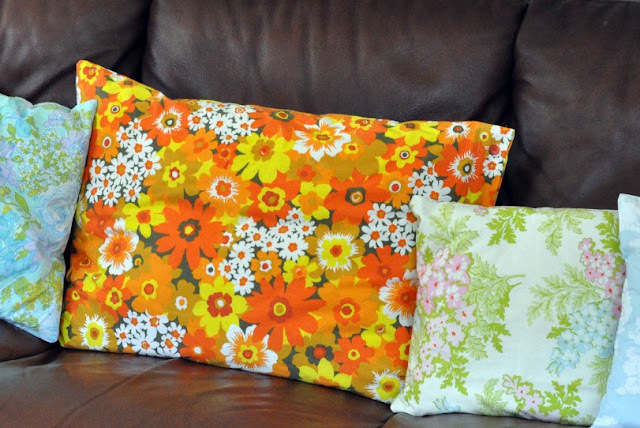 I love your beautiful orange flowered pillow! When I was a teenager, my bedroom was decorated in yellow and orange - those colors make me so happy! Your home is so welcoming. Your space is lovely and oh, so cozy looking. Makes me want to curl up and take a nap. I think a few bloggers were on the same page recently. 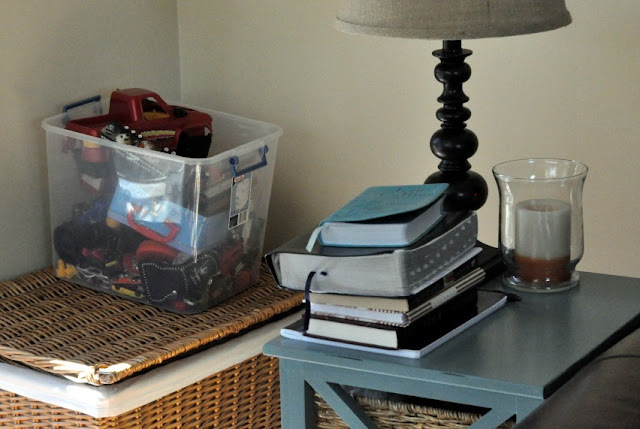 I blogged Monday about the, seemingly, frantic need in blogland to constantly "improve" things that really are perfect just as they are. I live a simple lifestyle and enjoy simple things, old and worn. I am so with you on this,I do think they change directions for us to buy and buy and buy. I love the all white decorating and really thought about it for me but I love color way too much. I have lots of furniture I will be painting white but not everything in every room...like your pillows. You are so lucky that you get to go to the Rose Bowl flea market! 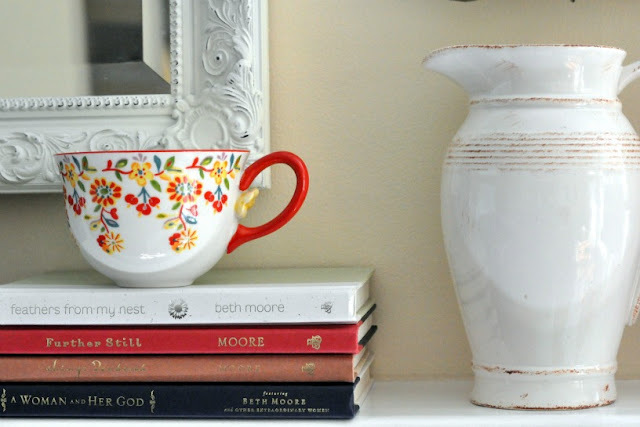 I love seeing a home that reflects the person who lives there. Love all your wonderful spots of color! Visiting from the B Farm and now following you! I absolutely love this room. The colors are beautiful, but there is something I can't quite put my finger on that I like about it. It so comfort looking I guess.